As a small business owner, it is essential for you to use every resource available for marketing and promotions, especially at the lowest price possible (free!). Although you already have a website and a loyal following on your email or contact list, expanding to social media outlets could give you the boost you're looking for in order to tap into a whole new following of potential customers. So if you have never used Facebook in connection with your business here are some simple steps and ways to help you get started. Do not stress. You do not need to be a tech wizard to begin. Sign up on Facebook.com under your business name. For birth date, enter the businesses birth date, home town and phone number. Upload your best high quality photos of your storefront, employee group, or your products/services in action. Use the best representative photo of your business as your cover picture on your profile page. Your profile picture should be your logo/brand. Start your friends list with sending request to family and friends. Some of your first post should include thanks to your long time customers, pictures of products/services and request to your friends to "share" your page to help you get your first 100 "likes". You should be very careful to proof read every post you before you post it for errors. You may want to make a post schedule according to promotions you are running. Ex: if you are having a big sale this coming weekend, you will want to introduce it to your Facebook post by Wednesday to give it time for the news to spread. Remember this is social media, so be sure to check your notifications often to filter and respond to comments to ensure quality customer service. 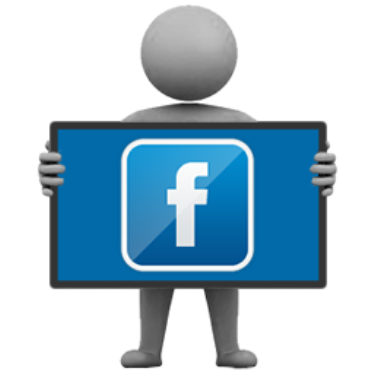 Direct Facebook promotions include, but are not limited to, giveaways. Make sure to clearly identify the rules to participate; must "like" your page, not just your post, and "share" the post with their friends. Make sure the giveaway is something associated with your business and is anticipated to encourage the most shares possible. You should see your number of "likes" increase dramatically with giveaways. For established users of Facebook, you often times reach a plateau point and need to make some adjustments to see a rise in responses. For other Facebook users, you have too much of a response to keep up with. This is when it is a good time to sell products/services directly using a Facebook store. Investigate options on the web for apps that will set your business up for the Facebook store. Look into more information than just prices, but also what the app can deliver to fit your business needs. F-Commerce has grown into more than just a fad so be sure to make your Facebook store an interactive and fun experience for your customers while offering a diverse range of your products/services as well.